Integration of complementary medicine in the public healthcare system of the Region of Tuscany, Dr Elio Rossi. 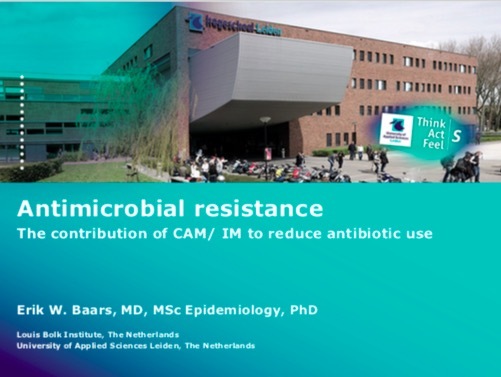 Antimicrobial resistance, the contribution of CAM/IM to reduce antibiotic use, Prof Erik Baars. Antibiotic prescription rates, Dr Esther van der Werf. Complementary and alternative medicines for acute respiratory infections: a systematic review of qualitative studies, Dr Merlin Willcox. Fever management educational strategies against antimicrobial resistance, Prof David Martin. Post conference paper of the EUROCAM CAM-AMR Conference 2018. © 2019 Eurocam. All Rights Reserved.